Standard Bank Deputy Managing Director Md Motaleb Hossain and Prime Group of Industries Chairman and Managing Director MA Awal exchange documents after signing an agreement on salary payment at SBL boardroom in the capital recently. Standard Bank Limited and Prime Group of Industries signed an agreement for specialised services of retail banking named “Employee Savings Account Services” recently at SBL boardroom in the capital. Under the agreement, around five thousand employees of Prime Group of Industries will get their salaries through the benefit-rich savings account of SBL, said a press release. Deputy Managing Director of Standard Bank Md. 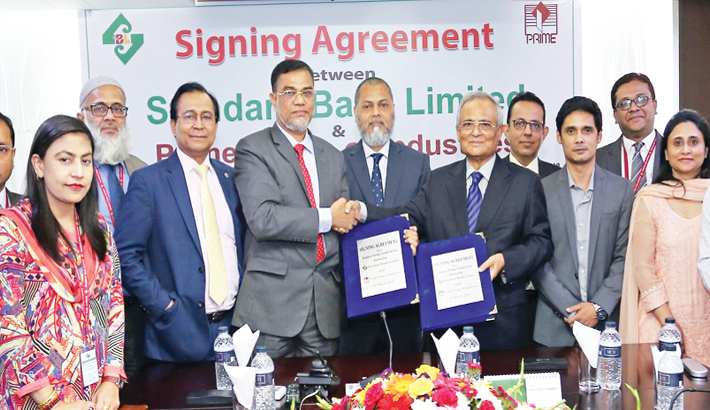 Motaleb Hossain and Chairman and Managing Director of Prime Group of Industries MA Awal signed the agreement on behalf of their respective organisations. Mamun-Ur-Rashid, Ma- naging Director and CEO, Md. Tariqul Azam, Additional Managing Director of SBL, Md. Abul Basher, DMD, Directors Asif Mahmud and Sanjida Awal of Prime Group of Industries and senior officials of both the organisations were present on the occasion.